A soldier in an usher uniform stands watch as Chinese President Xi Jinping, bottom, delivers a speech at the opening ceremony of the 19th Party Congress at the Great Hall of the People in Beijing (Oct. 18, 2017). Exploring China’s new Central Foreign Affairs Commission. Xi Jinping has a global vision for China and has centralized foreign policy around himself and the CCP. In this six-part blog series, MERICS researchers take a closer look at the (new) setup of China’s foreign policy leadership, institutions, budget, and personnel – as well as on its policy approach to Europe. This is part 2; see part 1 of the series here. In overhauling China’s foreign policy, party and state leader Xi Jinping started at the top. On March 21, 2018, during this year’s National People’s Congress, Beijing announced a major reshuffle of government and party institutions. As part of this reform, four leading small groups, including the Leading Small Group (LSG) on Foreign Affairs, were upgraded to Commissions. 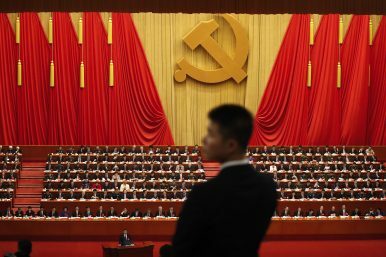 The establishment of the Central Foreign Affairs Commission appears to strengthen the role of the Chinese Communist Party (CCP) in China’s foreign policymaking. The new body will likely have a higher standing than the former Foreign Affairs LSG and further sideline the government agencies in charge of foreign policy. Information about the group is sparse, however, and there are no historical parallels to draw upon. Observers are likely to lack detailed information regarding possible changes in the functioning, staffing, membership, or budget. The new commission held its first meeting on May 15, 2018, when Xi Jinping was revealed as its head. During the meeting, Xi called for enhancing the party’s centralized and unified leadership over foreign affairs and he pledged to continue promoting the Belt and Road Initiative (BRI). Official media reports also mentioned that Premier Li Keqiang as deputy head of the Commission and former Minister of Foreign Affairs Yang Jiechi as its director of the general office. Vice President Wang Qishan was also identified as a member of the commission. However, it is unclear to what extent this is a major change in terms of membership and ranking, or whether these officials were also members of the Foreign Affairs LSG. This upgrade will further tighten the Party’s control over China’s foreign policy, as presumably all foreign policy decisions will now have to be made or approved by the commission. This will further reduce the limited leeway that ministries had in the past to implement their own initiatives and make their own policy decisions. This recentralization of power could make the foreign policymaking process in China even more inefficient by adding additional layers of bureaucracy. A more coordinated foreign policy, however, may also have upsides for China as well as for its diplomatic counterparts. Having the commission lead policymaking and implementation from the top could lead to clearer messaging from the various Chinese government and party departments. A greater authority of the commission inside the Chinese system of governance might also lead to more consistent implementation. Helena Legarda is a research associate at the Mercator Institute for China Studies (MERICS) in Berlin, Germany.